"The international stage success seen by more than 42 million people in 145 cities all over the world!" 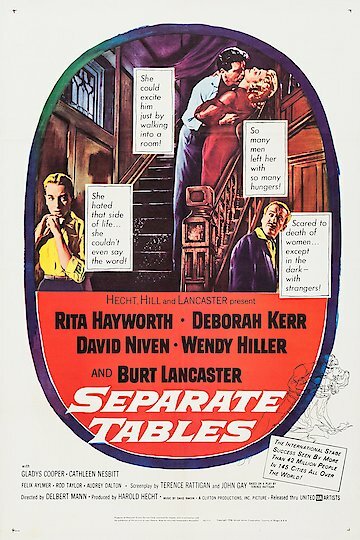 Separate Tables is an old American drama starring Rita Hayworth. The film is is based on two different one-act plays that were written by Terence Rattigan. This film won two Academy Awards for the performances in the film. The film starts when Major David Pollock tries to steal an article featuring him from the West Hampshire Weekly News and fails. His attempts to keep the article out of the news only makes people even more aware of the article. The article is about a sexual harassment incident that took place in a theater that Mr. Pollock was involved in. Because of the incident one of the residents of the hotel, Mrs. Railton-Bell, wants to have Pollock removed from the hotel. She holds a meeting of all of the residents of the hotel and they meet with the hotels manager to present the issue. Mrs. Railton-Bell presents her feelings to the hotel manager and this leads to a variety of incidents. There is also a love story between Rita Hayworth and another character that runs through the film. Separate Tables is currently available to watch and stream, buy on demand at Amazon, Vudu, iTunes online.